Emerging Markets Communications (EMC) is a provider of hybrid global satellite and terrestrial communications. Utilizing a high quality, fully managed network, EMC offers private end-to-end satellite and terrestrial solutions in more than 140 countries with the ability to provision service to the rest when requested. The US-based company is headquartered in Miami, Florida and powered by its network of strategically located, wholly-owned support centers (Argentina, Germany, Kazakhstan, Russia, UK, Thailand, UAE, US, Kenya, Angola, Nigeria and Senegal). EMC operates three wholly-owned teleport facilities in Europe and the US. Their customer base comprises Global Fortune 500, Governments, multilateral organizations, NGOs, and large intergovernmental organizations including United Nations. Thomas Kayser, the Managing Director of the Human Productivity Lab's European Consulting Practice, was invited to visit EMC's flagship Teleport and Data Center facility in Raisting, Germany to discuss the network, capabilities, and EMC's new HD Connect HD/telepresence service with Thomas Luketich, who runs the telepresence and videoconferencing business. EMC has teleport and datacenter facilities in Europe and the US, Raisting is EMC's biggest and one of the three largest teleport facilities in the world. There are 22 large antennas from 11m to 32m in diameter, covering the Americas, Europe, Africa, Middle East and Asia using all major satellite operators. Raisting is the ideal location in Central Europe: strategically located near Ammersee Lake in Bavaria and surrounded by the Alps, host to Germany's major national and international fiber backbone ring, and with the flexibility to meet current and future customer requirements. In addition there are 120,000 square feet of secure telehouse and data center facilities to provide business continuity and disaster recovery services. EMC HD Connect is the first and most competitive globally available HD/Telepresence service based on Video on Demand. HD Connect offers HD quality for all locations and office sizes, favoring collaboration and friendly work environments. 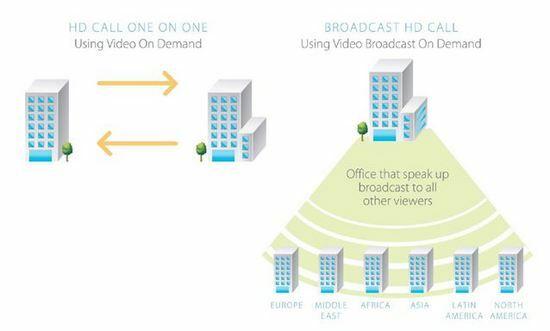 EMC's HD Connect is the first globally available HD/Telepresence service that operates with a "bandwidth on-demand" model. Each HD or Telepresence circuit is "turned on" when the user starts or accepts an HD or Telepresence call. HD Connect offers HD quality connections and a unique multicast feature that provides a significant cost savings when conducting very large video meetings. Built with carrier class equipment from Cisco/Tandberg and fully compatible with all major video conference equipment, HD Connect is fully integrated to myEMC Link Monitoring and Control tool. HD Connect is also fully integrated to major desktop Unified Communication platforms from Cisco and Microsoft. It is an easy to use system that does not require a scheduling system. I had the opportunity to visit EMC's flagship teleport facility in Raisting. First of all, it's amazing to see the huge antenna arrays and the techniques behind delivering the service at a close range. EMC acquired the complex from Deutsche Telekom AG a few years ago. Combined with their other teleport facilities in Hawaii USA and Redditch UK, the facility allows EMC to offer communication services to every continent, island, and ocean-going craft and provide coverage in all 196 countries of the world. 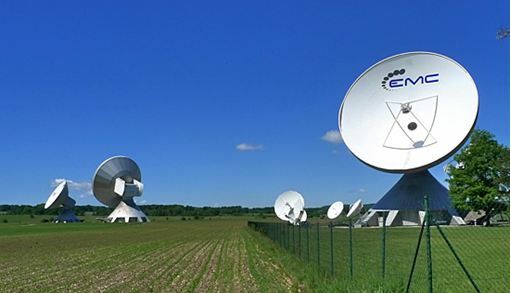 EMC provides true end-to-end communications services to organizations that have operations in countries where satellites are their best and/or only option for communications. EMC has also the infrastructure, personnel and service delivery capabilities to offer unique connectivity and application services (HD Connect, SpeedNet and UCNet) for corporate applications including Voice, Video and internet access. With the newly launched HD Connect EMC takes a step into the telepresence and HD videoconferencing market with a simple pay-as-you-go video-on-demand model. Interesting for organizations either as a video overlay network or as enhancement to their existing MPLS corporate WAN. EMC's partnership with the AT&T Business Exchange (will be announced shortly) can assure the capability for intercompany collaboration. EMC provides a fully managed service, including installation, maintenance and a Service Level Agreement on the application layer. They have own deployment teams worldwide or can use their global partner network. EMC has bundled a package based on a 2 screen Cisco/Tandberg HD video conferencing equipment and EMC VMS firmware. This includes 10 hours of "prepaid" video-on-demand with additional usage billed per hour. The pricing is more than reasonable especially for a service available at essentially any location on the planet! Altogether I was impressed by EMC's global capabilities, planetary coverage and the simple and ready-to-go video-on-demand solution with broadcast HD quality. We will definitely keep track of the further developments and announcements. Thomas Kayser is a productivity-focused technology consultant with a wide knowledge in telepresence and visual collaboration as well as telecommunication and network solutions. He is managing the Human Productivity Lab's consulting practice in Europe, an independent consultancy and research firm that helps organizations design telepresence strategies and deploy telepresence solutions. 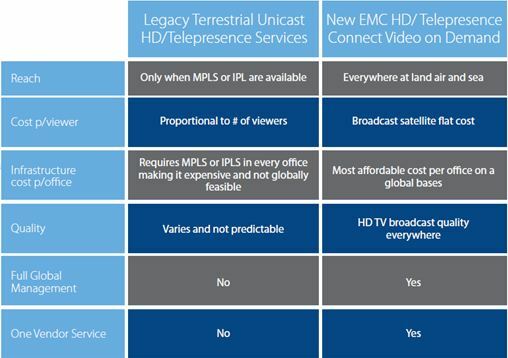 EMC's HD Connect is the first globally available HD/Telepresence service that operates with a \"bandwidth on-demand\" model. Each HD or Telepresence circuit is \"turned on\" when the user starts or accepts an HD or Telepresence call. HD Connect offers HD quality connections and a unique multicast feature that provides a significant cost savings when conducting very large video meetings. EMC has bundled a package based on a 2 screen Cisco/Tandberg HD video conferencing equipment and EMC VMS firmware. This includes 10 hours of \"prepaid\" video-on-demand with additional usage billed per hour. The pricing is more than reasonable especially for a service available at essentially any location on the planet!